Don't you just love suncatchers? I love seeing the pretty colors in the sunshine! 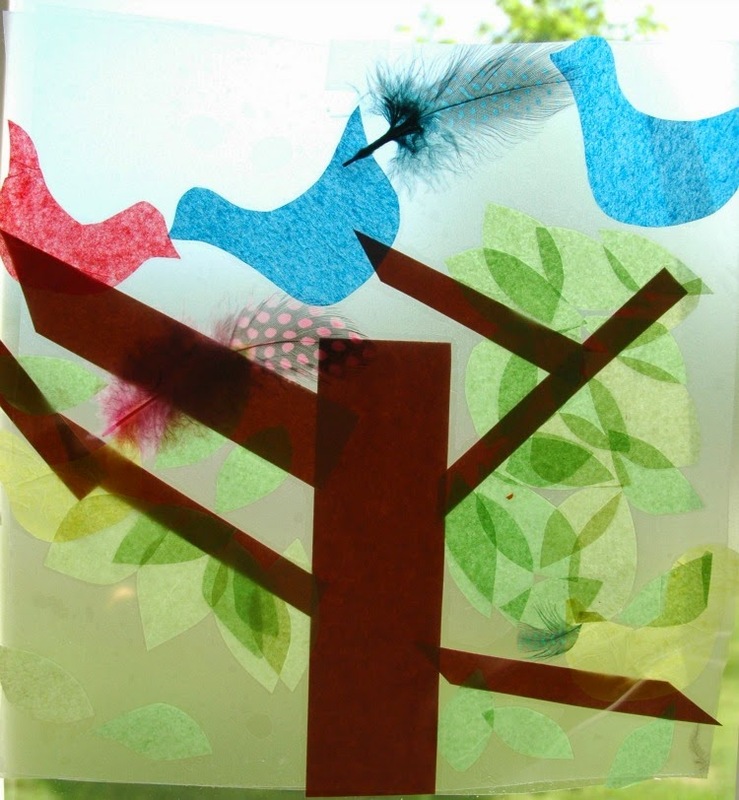 We are starting a week of bird themed home preschool, and we kicked it off with these bright and cheerful suncatchers. Here's how to make your own. Gather your materials. 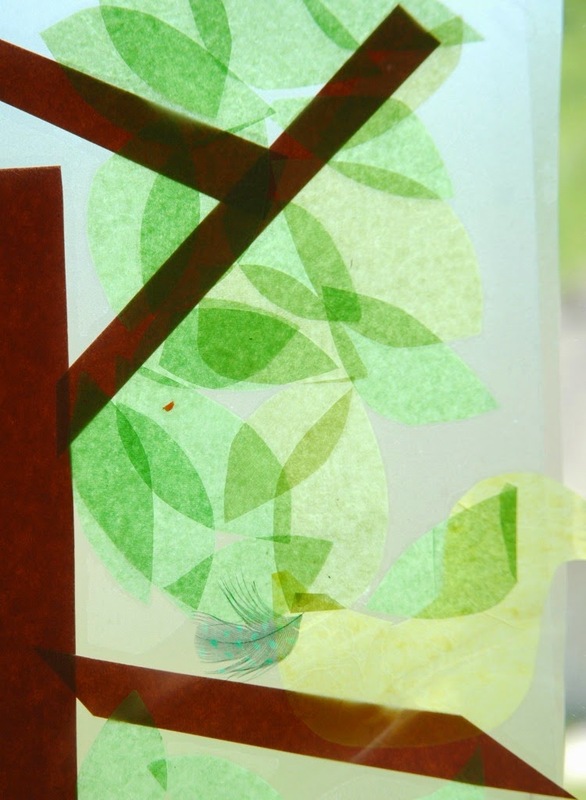 You'll need tissue paper (we used green, red, yellow, and blue), brown construction paper, some small craft feathers, and clear self-adhesive film (Con-Tact paper). Begin by cutting your shapes. For the tissue paper leaves and colored birdies (free hand them-- you can do it! ), I folded strips of tissue paper so that I essentially had a small stack of many layers. That way you just have to cut a few times. 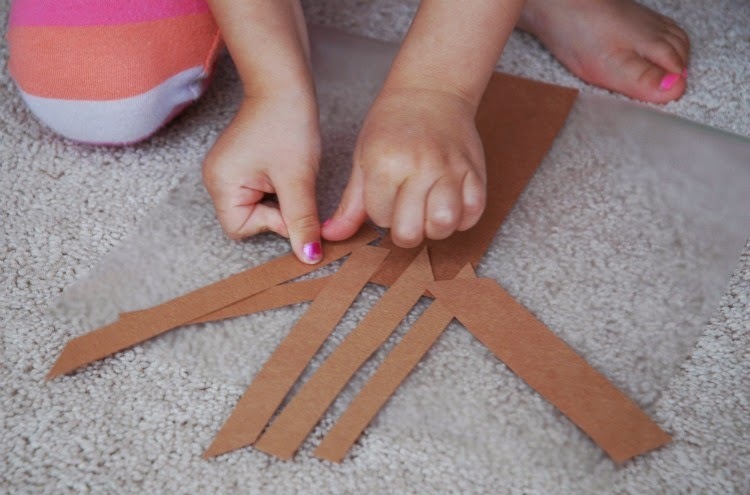 With the brown construction paper, make rectangles in various thicknesses and widths so that your child can build their own tree with different sized branches and limbs. Next, give your child a piece of clear self-adhesive film. Ours were about 1 foot square. 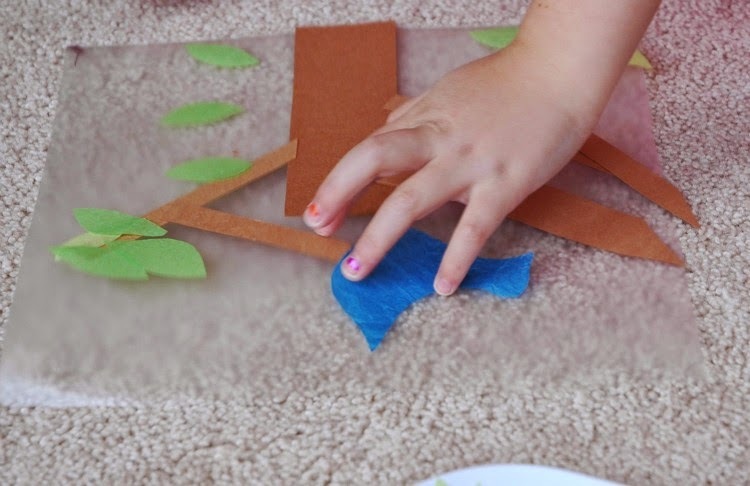 Help your child build a tree, with a thick trunk, branches and limbs. 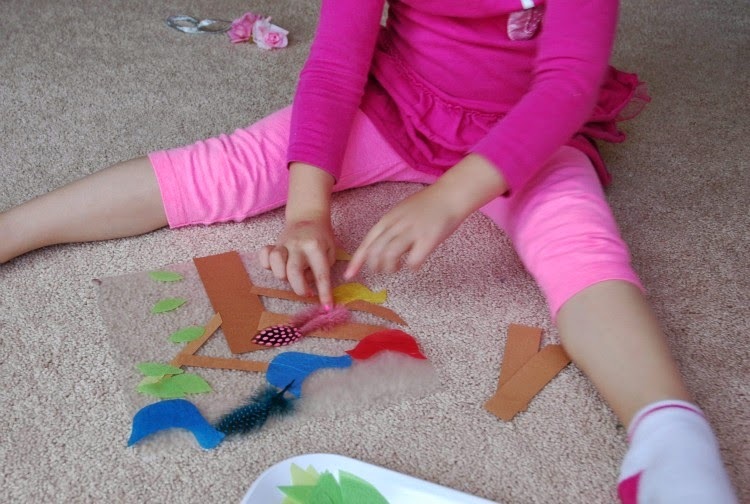 Then show your child how to add leaves, birds, and feathers. I made a 'one feather per bird' rule to avoid feather overload. When your tree is complete, add a second piece of clear self-adhesive film to the top. Cut it to the same size, and then carefully roll it in place, starting at the bottom. Hang them up in your window and let the sun stream through! I love how leaves show up as different colors depending on how many layers there are. And my favorite bird was this little yellow guy hanging out on a low branch. You have to look hard to find him! 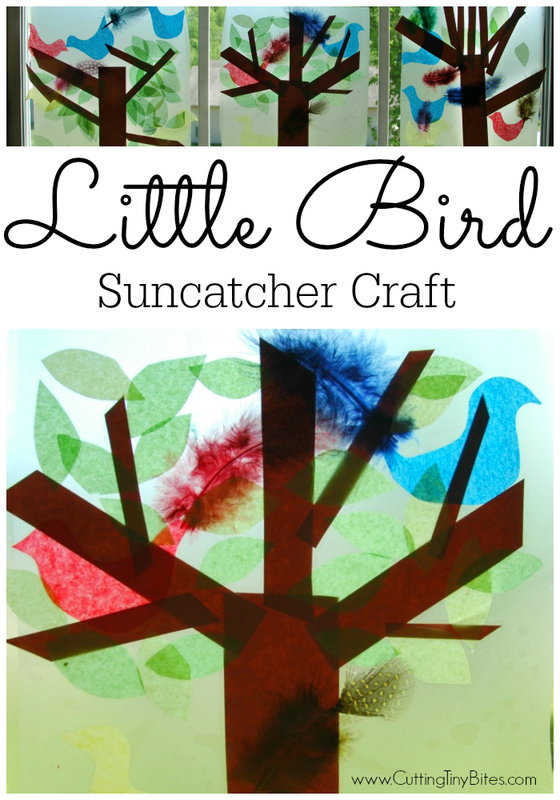 Little Bird Suncatcher Craft for Kids. 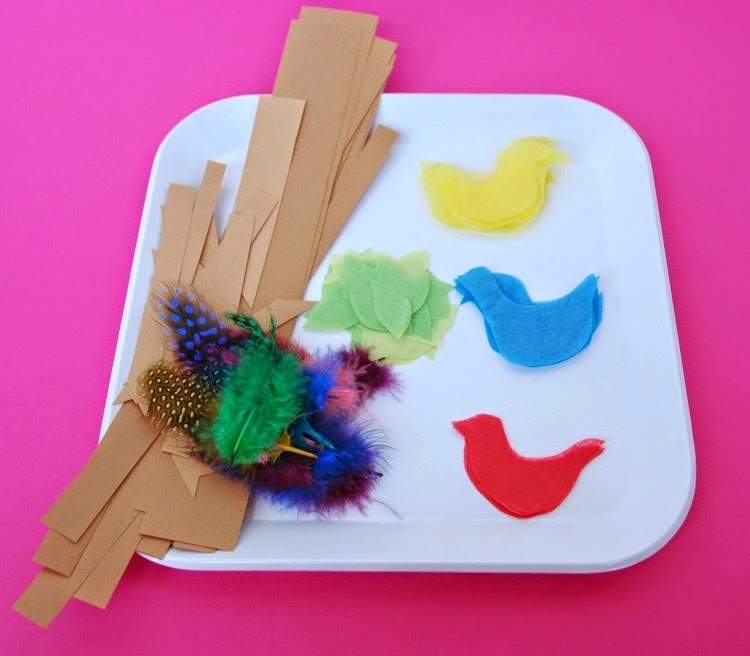 Simple fine motor activity, great for a toddler, preschool, or kindergarten theme unit on birds, trees, or spring.